Research into the use of perovskite materials as solar cells has boomed in the last several years, following reports of high energy conversion efficiencies, which have continued to climb. 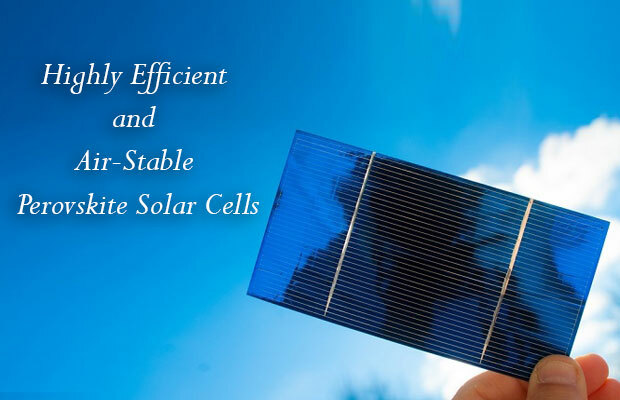 New research published in the journal Materials Today reveals how to improve the lifetime of these solar cells. Despite the intense interest in the materials for solar energy applications, “improving the stability of perovskite solar cells is a challenging task,” explains Dr. Chang Kook Hong, corresponding author, from Chonnam National University in South Korea. Perovskite is the general term for any mineral that has the same crystal structure as a particular form of calcium titanium oxide, first unearthed in the Ural Mountains of Russia in 1839 and named for the Russian mineralogist L. A. Perovski. The unique structure of perovskites can be tweaked for particular properties by changing the various cations and anions from which they are formed. Fundamentally, the structure has the general chemical formula ABX3 where the ‘A’ and the ‘B’ represent positivelycharged metal ions, cations, that are very different in size, and the ‘X’ is a negatively charged anion that bonds to both metal cations linking them together in the crystal. Perovskites can be synthesized in the laboratory very cheaply and formed into thin films that can be incorporated into solar cells. Cations need not be metal ions, but can be any positively-charged ion, such as the ammonium ion or an organic ion; provided A and B are different sizes and a suitable negative ion is used they will give the perovskite structure. Dr. Hong and colleagues have developed a method known as co-precipitation to make a thin film comprising nanoporous nickel oxide as the hole transporting layer (HTL) for a perovskite solar cell that uses the unique composition of FAPbI3 and or MAPbBr3 as the perovskite layer. Holes are the positive equivalent of negative electrons in discussions of electrochemistry. FAPbI3 is formamidinium lead iodide and MAPbBr3 is methylammonium lead bromide. In addition, they used an organic air-stable inorganic zinc oxide nanoparticles c o m p o u n d a s t h e E T L ( e l e c t r o n transporting layer) in order to protect perovskite layer from air. “We successfully optimized the metal oxide based HTL and ETL protecting layers for highly efficient perovskite absorber by a simple method which can make air-stable photovoltaics,” explains co-author Dr. Sawanta Mali. “Our main goal is to solve the problem of the tedious process of making conventional additivedoped, highly expensive, unstable HTLs by replacing low-cost, inorganic airstable p and n-type metal oxides,” Dr. Mali added. Preliminary tests of the prowess of their device using these perovskites device architecture revealed a 19.10 percent (+/- 1 percent) power conversion efficiency. The current density of the device was almost 23 milliamps per square centimeter and it could generate 1.076 Volts. Importantly, the device could sustain four-fifths of this level of efficiency in use for around five months. The team suggests that their approach could lead the way to highly efficient and air-stable perovskite solar cells. “This technique is limited to the laboratory scale, however large-scale fabrication should also be possible with this device architecture,” said Dr. Hong.